Now Adam knew Eve his wife, and she conceived and bore Cain, and said, ‘I have acquired a man from the LORD.’ Then she bore again, this time his brother Abel. Now Abel was a keeper of sheep, but Cain was a tiller of the ground. And in the process of time it came to pass that Cain brought an offering of the fruit of the ground to the LORD. Abel also brought of the firstborn of his flock and of their fat. And the LORD respected Abel and his offering, but he did not respect Cain and his offering. And Cain was very angry, and his countenance fell. The name, Cain, means to get. We can only imagine how delighted Adam and Eve were when they got a man-child from the Lord. Unfortunately, however, their firstborn son was destined to bring them a great deal of heartache. In this chapter, we will see the awful consequences of Adam’s sin as it worked itself out in the lives of his children. Cain tried to approach God apart from faith. Perhaps he tried to copycat the offerings he had seen Able make. And, like many churchgoers today, the end result was that he simply carried out a religious ritual ... completely apart from real faith. There are many motives for being religious and doing religious things but the only essential for connecting with the true and living God is real faith. Hence, Cain’s mere religious exercise was rejected and it really angered him. The smoke of Abel’s offering ascended upward, a clear sign of acceptance by God … but Cain’s did not. He was probably standing off to the side of his fire choking on the smoke! 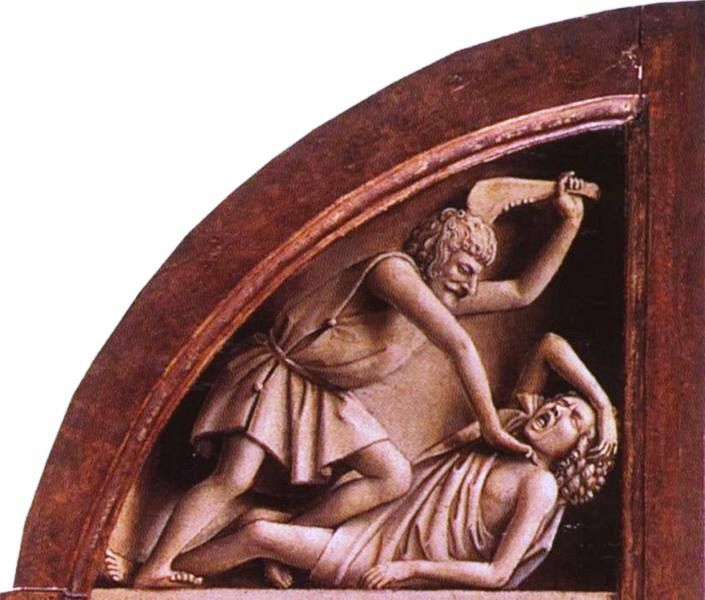 The meaning was not lost on Cain and our text says his face fell. So the LORD said to Cain, ‘Why are you angry? And why has your countenance fallen? If you do well, will you not be accepted? And if you do not do well, sin lies at the door. And its desire is for you, but you should rule over it.’ (KJV reads, And unto thee shall be his desire [Able’s desire], and thou shalt rule over him.) Now Cain talked with Abel his brother; and it came to pass, when they were in the field, that Cain rose up against Abel his brother and killed him. God is a very merciful and good God. He desires that all men be saved and come into right relationship with him (II Pet. 3:9). And, what we have here is God’s attempt to make it so for Cain. It was God who took the initiative with Cain. He came to Cain and counseled him to change his ways and thinking. Further, he assured Cain that, if he would change, being the eldest in the family, he could still be in charge. As the firstborn, he could still take the lead and be the head over Able. God warned him, however, that if he was not careful, sin would be his ruin. He told Cain that sin was like a lion crouching outside his door ... just waiting to pounce and drag him away. May we step aside here for a minute? It is an axiomatic truth that all human beings are sinners (Rom. 3:23). It is also true that all believers struggle with sin. Not all believers have problems with the same sins, but all wrestle with one sin or another. Sometimes believers harbor “pet sins” that they treasure and invite into their lives … things like a bad temper or an unforgiving spirit, pride and envy, filthy language and lying, immorality, gluttony and materialism. There is a list in Romans 1, that one of my professors called the ugly brood (Rom. 1:29-31). God’s desire is that his children be free from these destructive, ravaging lions and the 64,000 dollar question becomes … How and when will God accomplish this? The answer is, When he takes us home to be with himself! Meanwhile, victory over sin in one's daily walk with God comes about when at least three basic principles are in place. Keep back your servant also from presumptuous sins; let them not have dominion over me. Then I shall be blameless, and I shall be innocent of great transgression. Let the words of my mouth and the meditation of my heart be acceptable in your sight, O LORD, my strength and my Redeemer. We’re talking about our fellowship with God here … our walk with God. When we sin, we come immediately to him and ask for his forgiveness. So, keep short accounts with God. Take care of sin right away. Confess, be cleansed, move on. God’s job is to do the sanctifying of his children. If you wish to pursue this further, carefully read the first chapter of First John and ask yourself what a “light walker“ looks like … as defined in that chapter. He/she certainly is not sinless. Rather, they are confessors. The chapter ends by warning that if anyone says they have no sin they make God a liar and the truth is not in them. ...knowing this, that our old man was crucified with him, that the body of sin might be done away with, that we should no longer be slaves of sin. For he who has died has been freed from sin. Now if we died with Christ, we believe that we shall also live with him, knowing that Christ, having been raised from the dead, dies no more. Death no longer has dominion over him. For the death that he died, he died to sin once for all; but the life that he lives, he lives to God. Likewise you also, reckon yourselves to be dead indeed to sin, but alive to God in Christ Jesus our Lord. Therefore do not let sin reign in your mortal body, that you should obey it in its lusts. And do not present your members as instruments of unrighteousness to sin, but present yourselves to God as being alive from the dead, and your members as instruments of righteousness to God. For sin shall not have dominion over you, for you are not under law but under grace. Absolutely, the greatest barrier to knowing freedom from besetting sins is UNBELIEF. May I ask a question? Are you dead to sin? The only scripturally correct answer a believer can give is, YES, PRAISE GOD, I AM! I HAVE THE WORD OF GOD ON IT! Only when we believers believe and act on God's truth can we experience real victory over sin. By faith, when we count ourselves to be dead indeed to sin … then, and only then, can the victory come. Why? Because you and I have already been set free ... glory to God! Say it with me ... I am not a slave to sin! In Christ, I am dead to sin. Sin no longer has dominion over me! I have been made alive unto righteousness in Christ Jesus. Did you say that? It’s true, you know. We have God’s Word on it. You and I can take it to the bank! Third, the child of God must get into the Word of God often enough to be delivered by its transforming power. I beseech you therefore, brethren, by the mercies of God, that you present your bodies a living sacrifice, (Note: this is the "want to" part) holy, acceptable to God, which is your reasonable service. And do not be conformed to this world, but be transformed by the renewing of your mind, (Note: this is the reading of the Word of God part) that you may prove what is that good and acceptable and perfect will of God. How can a young man cleanse his way? By taking heed according to Your word ... Your word I have hidden in my heart, that I might not sin against You. God warned Cain that sin would devour him. But, Cain decided to hold on to his sins of jealousy, resentment and anger. And later, when he caught his brother alone in the field, he murdered him. It was a great transgression ... like the one David speaks of in Psalm 19, above. Cain turned a deaf ear to God's warning about sin. And, like a lion, it took him down. As a result, his life was ruined. He ended up estranged from God … a murderer and a vagabond. Have mercy upon me, O God, according to your lovingkindness; According to the multitude of your tender mercies, blot out my transgressions. Wash me thoroughly from my iniquity, and cleanse me from my sin. For I acknowledge my transgressions, and my sin is always before me. Against you, you only, have I sinned, and done this evil in your sight; That you may be found just when you speak, and blameless when you judge. Behold, I was brought forth in iniquity, and in sin my mother conceived me. Behold, you desire truth in the inward parts, and in the hidden part you will make me to know wisdom. Purge me with hyssop, and I shall be clean; Wash me, and I shall be whiter than snow. Make me hear joy and gladness, that the bones you have broken may rejoice. Hide your face from my sins, and blot out all my iniquities. Create in me a clean heart, O God, and renew a steadfast spirit within me. Do not cast me away from your presence, and do not take your Holy Spirit from me. These words of sorrow and repentance brought forgiveness and restoration to David. But Cain’s surly words … Am I my brother’s keeper? ... only made matters worse. And Cain said to the LORD, ‘My punishment is greater than I can bear! Surely you have driven me out this day from the face of the ground; I shall be hidden from your face; I shall be a fugitive and a vagabond on the earth, and it will happen that anyone who finds me will kill me.’ And the LORD said to him, ‘Therefore, whoever kills Cain, vengeance shall be taken on him sevenfold.’ And the LORD set a mark on Cain, lest anyone finding him should kill him. Now, why do you think God didn’t execute Cain on the spot for murdering his brother, Abel? The answer lies in the fact that capital punishment was not instituted by God until after the Flood in Noah’s day. There was no such law in the pre-Flood world in which Cain lived. Also, in spite of the enormity of Cain’s sin, the Lord wanted to extend mercy to him. Truly, his mercy endures forever. Keep in mind that, at that point in time, all who were living on the earth were closely related. And, doubtless, they were all greatly incensed by what Cain had done. Revenge was the order of the day. But God forbade it, concerning Cain. And, with great mercy, he placed a mark on Cain to protect him. We don’t know what that mark was, but God saw to it that it was sufficient to deter anyone from laying hands on Cain. Also, God punished Cain by cutting him completely off from his chosen occupation of farming by placing an additional curse on the ground when it came to Cain. This was a curse on top of the curse that was already in place. As a result, Cain was forced to change his occupation completely. From that day forward, the ground did not yield anything to Cain. This was appropriate, by the way, because Cain had defiled the ground with his own brother’s blood. Then Cain went out from the presence of the LORD and dwelt in the land of Nod on the east of Eden. This statement, Cain went out from the presence of the Lord, is a very sad one. There is no record that Cain ever spoke to the living God again. He turned away from God, unrepentant and bitter. He just walked away. Tragic. Don't you just hate it when someone turns their back on the forgiveness and mercy of God and just walks away? It is especially hard in the case of a loved one. Our text says Cain went to the land of Nod. Often the question is asked, Where did Cain get his wife? The answer, of course, is he married one of his sisters or nieces. For obvious reasons, the restriction on marrying close family members was not yet in place. Also, by this time there were many more people on the earth than one might suspect. You will remember that Adam and Eve were told to be fruitful and multiply and that was the rule of the day with them as well as their offspring. Seth didn’t come along for an hundred and thirty years, but many others, no doubt, already had. And Cain knew his wife, and she conceived and bore Enoch. And he built a city, and called the name of the city after the name of his son; Enoch. To Enoch was born Irad; and Irad begot Mehujael, and Mehujael begot Methushael, and Methushael begot Lamech. Then Lamech took for himself two wives: the name of one was Adah, and the name of the second was Zillah. And Adah bore Jabal. He was the father of those who dwell in tents and have livestock. His brother's name was Jubal. He was the father of all those who play the harp and flute. And as for Zillah, she also bore Tubal-Cain, an instructor of every craftsman in bronze and iron. And the sister of Tubal-Cain was Naamah. Then Lamech said to his wives: 'Adah and Zillah, hear my voice; Wives of Lamech, listen to my speech! For I have killed a man for wounding me, Even a young man for hurting me. If Cain shall be avenged sevenfold, Then Lamech seventy-sevenfold. Here, we come to the second recorded murder in human history. Lamech, in the line of Cain, murdered a young man because the young man had hit him. He justified his action by proclaiming that if Cain can be avenged seven-fold on anyone who might try to take revenge ... surely he, Lamech, should be avenged seventy-fold … since the murder he committed was completely justified. What a heartless and vicious line Cain was planting on the earth. Truly, Cain was beginning to reap what he had sown. With this sad story, the Bible leaves the line of Cain. It will not be heard from again and would eventually be wiped out completely by the coming Flood. And Adam knew his wife again, and she bore a son and named him Seth, 'For God has appointed another seed for me instead of Abel, whom Cain killed.' And as for Seth, to him also a son was born; and he named him Enosh. Then men began to call on the name of the LORD. With the birth of Seth, we pick here the line through which the promised Seed would come. This phrase, then men began to call on the name of the LORD, is better translated … then men began to call themselves by the name of the Lord. When the godly line of Seth began naming their children, they started incorporating the Lord’s name in their children’s names. This speaks loudly of where their hearts were, does it not? It is equivalent to many today who, out of love for the Lord and his Word, take biblical names for their children. There are many names in the Old Testament that follow this custom of inserting a name of God within a name. For example, take the name, Ezekiel. The el ending of his name is one of the Old Testament names of God. Ezekiel then, means God is strong. When we get to chapter 6, we find a reference there to the sons of God. It is referring to Seth’s line ... the line who had been incorporating one of God’s names into that of their children. This was characteristic of the line of men who were following after the living God at that time.